George had a bit of an accident in the car while we were away, so when we got into the house I just wanted to have a quiet time with him. However, there was no quiet to be found. There were scritchy scratchy sounds in the walls, small kabooms that made Gibby jump, and then quiet little meows. I went upstairs and searched for cats - no luck. Back in the living room, the noises started all over again - it sounded just like a cat was stuck inside the wall, but the wall is only a single layer of plywood - there is no inside. 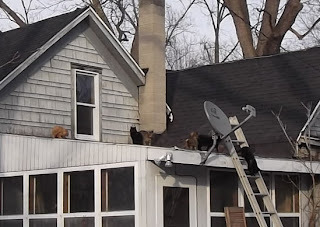 Back in the living room again - scritchy scratchy, Gibby jumping - so I went out into the new room, and there, up by the top of the chimney, three quarters of a cat was hanging down from the ceiling. He wiggled and squiggled and pulled himself back up into the ceiling. I moved a big stepladder over to where he was hanging, if he drops down again and swings out a little, his feet should land on the top of the ladder. I don't know if he was trapped up there when Joe did his repair or if he is an explorer who found a new way to break through from the roof. I don't even know if he's the only one, but I'm hearing more meowing and Gibby is back on the alert. 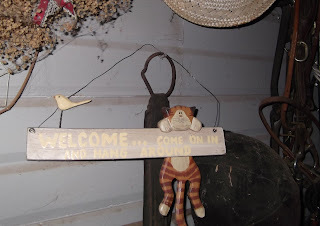 I have a sign at my back door that says, "Welcome...come on in and hang around" with a little cat hanging from the sign - I guess it was prophetic. The cat came down while I was writing this. I went out to check, scared him, and he raced right back up that stepladder and disappeared into the ceiling. A few minutes later, there was another big kaboom. Part of the ceiling fell down again. uurrrggghhhh!